In a baby-blue, navy and white AXO racing kit, courtesy of the European Union, a girl, 11, poses on her motorbike. It’s December 2015, and she’s ready to race. The poster girl for motocross in Zimbabwe, and a beacon of hope for her entire country, she’s living proof to young people that they can, with proper care, thrive beyond illness. The rider’s name: Tanya Muzinda. Her racing number: 61. The hashtag #TeamTanya is stamped on the front license plate of her racing bike, which is sponsored by Armored Graphix. The custom bike graphics company’s stickers cover almost every inch of the bike. Motocross is a timed motorcycle race over a closed winding dirt/mud trail with hills, jumps, and turns. When Tanya was 5, a friend of her father’s invited the family to Harare’s Donnybrook Raceway. Tanya’s father allowed her to try motocross, and Tanya, who already raced go-carts, instantly fell in love. 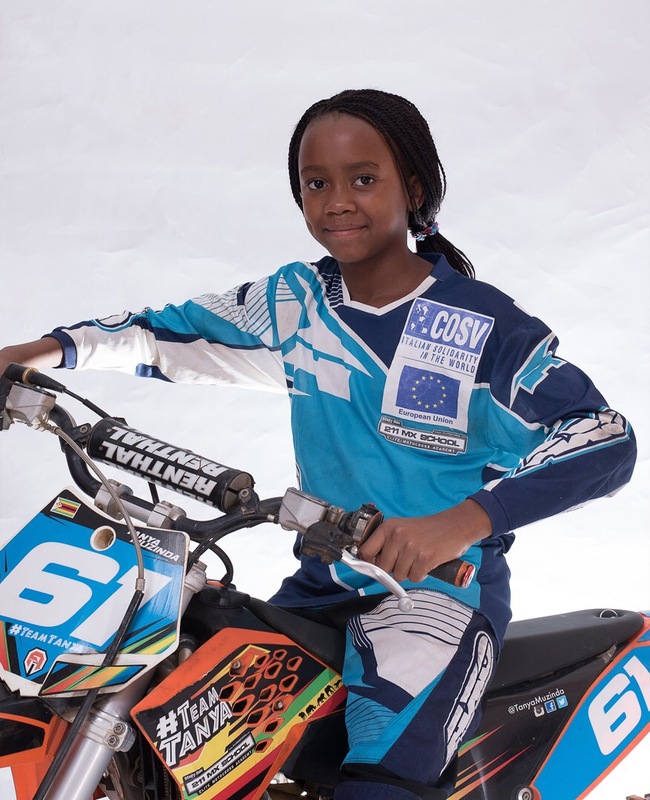 She placed second in her first competition, and became the first Zimbabwean girl to win a local motocross championship. Since then, Tanya, who hails from Harare, has traveled the world to compete. She had been working with a bike borrowed from that family friend, but the burnt orange 65 cc motorbike in the poster was a gift to Tanya, now 12, from the European Union Delegation of Zimbabwe. It was sent as a goodwill gesture, as Tanya had been selected by the United Nations as honorary ambassador for gender, youth and sport that August. Motocross is growing in popularity in Zimbabwe, where the most popular sports are soccer and croquet, and it was that honor, along with her fierce motocross abilities, that led to her appearance on the poster. The Children’s Hospital in Zimbabwe’s capital, Harare, is filled beyond capacity. One of four facilities belonging to Harare’s Central Hospital, it’s the only pediatric hospital in Zimbabwe. The Children’s Hospital treats kids who have been mauled or have HIV/AIDS, those who are malnourished, and those suffering from pneumonia or waterborne illnesses such as cholera and typhoid fever, along with other ailments. HIV is particularly prevalent, with nearly 15 percent of the country’s population infected, according to data from AVERT, an epidemic that has created nearly 1 million orphans. Surgeries, and even some common treatments, are difficult to perform amid the overcrowding and uncertainty. In 2008, the hospital was forced to close for two years when record-setting hyperinflation hit Zimbabwe. Some say there are issues dating to the country’s independence British colonization in 1980 that have hampered the hospital’s chances of prospering. “I realized I have much to offer. They needed a lot of skills,” she said. “I noticed as an entrepreneur [that] what was lacking in Zimbabwe was good branding, great visibility that could be global, and great marketing and advertising. Having lived in Silicon Valley, it was a no-brainer for me.” Sibanda teamed up with local entrepreneur Solomon Jama and founded Global Business Innovations, a company aimed at improving marketing and branding efforts in Zimbabwe and around the world. Nine months after Tanya was born — she’s the oldest of three siblings — her immune system weakened. Tawanda Muzinda and his wife Adiyon sent Tanya to live with her grandparents in the country’s “rural areas” for nearly four years. She returned to Harare feeling stronger, and was able to attend the local school. 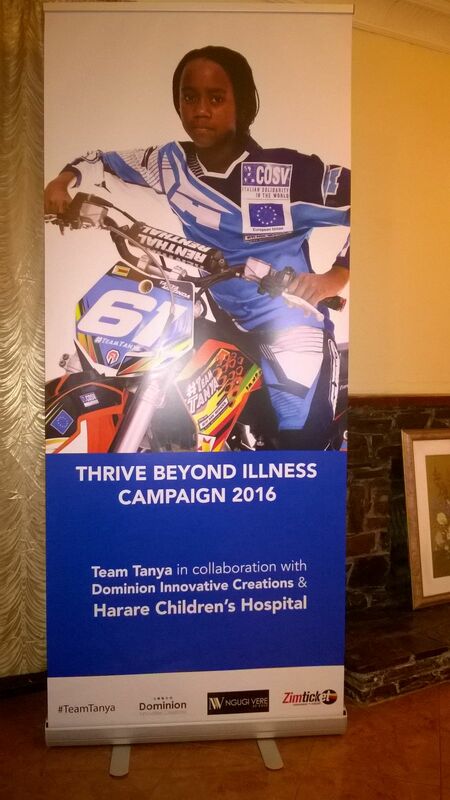 By mid-2015, a press conference was held to announce that Team Tanya – composed of Tawanda, Adiyon, Tanya and her Italian mentor, two-time women’s motocross champion Stefy Bau — was partnering with Harare Children’s. “It was a good feeling, because I got sick when I was younger, so I’m lucky I got to work and have the opportunity to give them hope,” said Tanya. Tanya has known since she was 7 years old — the first time she placed on the victory podium at Donnybrook Raceway — that she wanted to become a motocross world champion. Her new goal is to break her mentor/trainer Bau’s 2x Women’s National Pro Champion record. And within the past few years, she’s been named the Junior Sportsperson of the year, received the Teen Female Sport Award, Zimbabwe’s Rising Star award, and those are just a few of her accolades. Tanya hopes to compete in the British Women’s Motocross Championship this month.